I've loved Auntie Anne's Pretzels from the first time I tried it in the Philippines in the late 90's. Since then until now, it's one of those things that I just couldn't resist when I'm at the mall. How could I, when I can smell its wonderful aroma wafting over from like hundred feet away. But it's not just me, the hubs and the girls love Auntie Anne's too, and we all have the same favorite flavor --- Cinnamon Sugar. We never fail to buy some whenever we pass by an Auntie Anne's store. 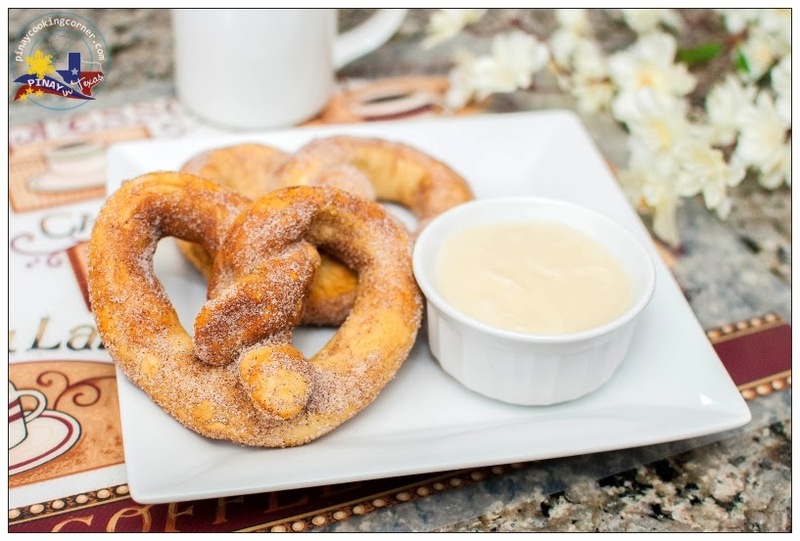 But when we feel like eating our favorite soft pretzels and we 're too lazy to go to the mall, we just make some at home. Yes, you read it right! We make pretzels at home! 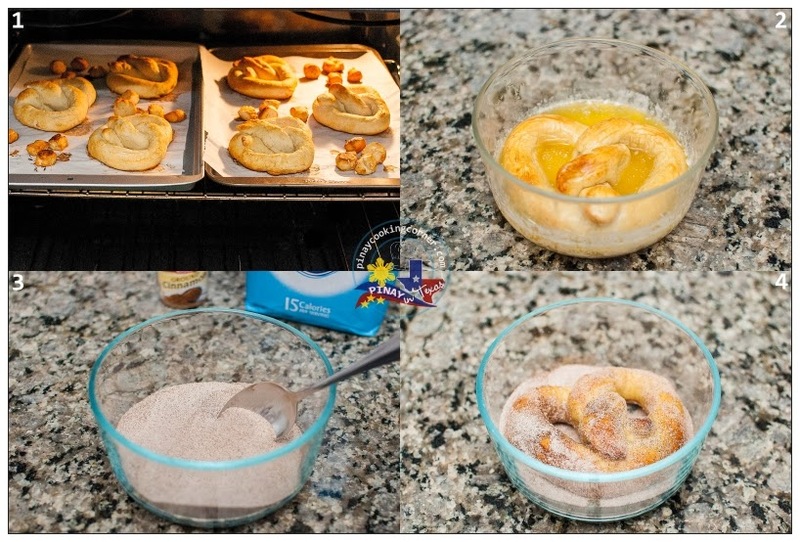 Whenever we crave for soft pretzels, we just whip them up at home...just like what we did last weekend. 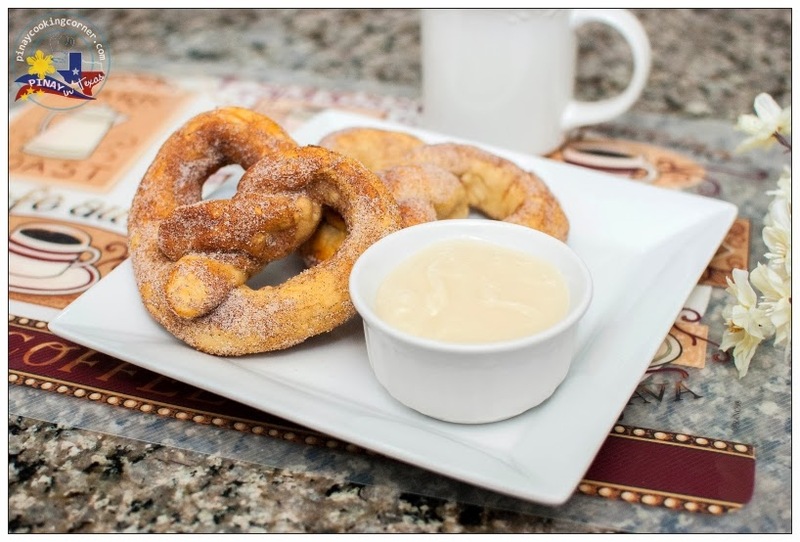 Thanks to this recipe from Food Network that I found a few years ago, we can enjoy homemade pretzels anytime. No need to stand and wait in a long line at the mall! 1. In the bowl of a stand mixer, dissolve yeast in 1 cup warm milk using a spoon. Let sit for 10 minutes. 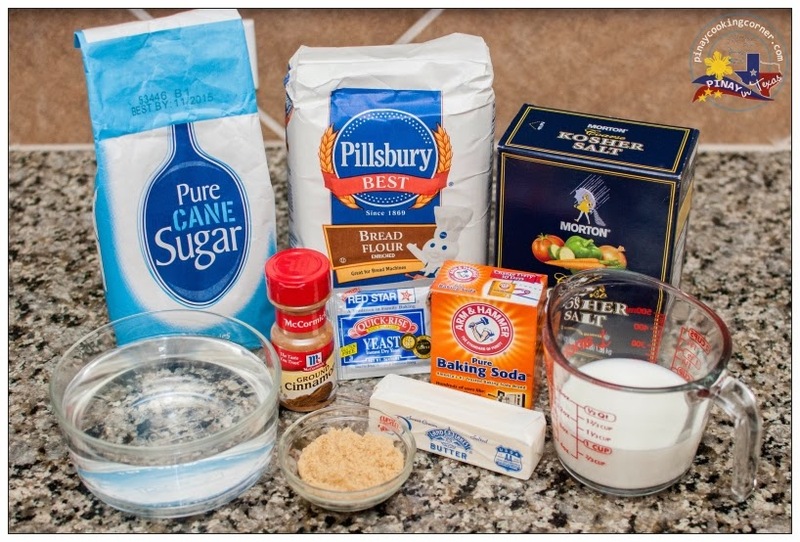 Add granulated sugar, brown sugar, butter and salt. 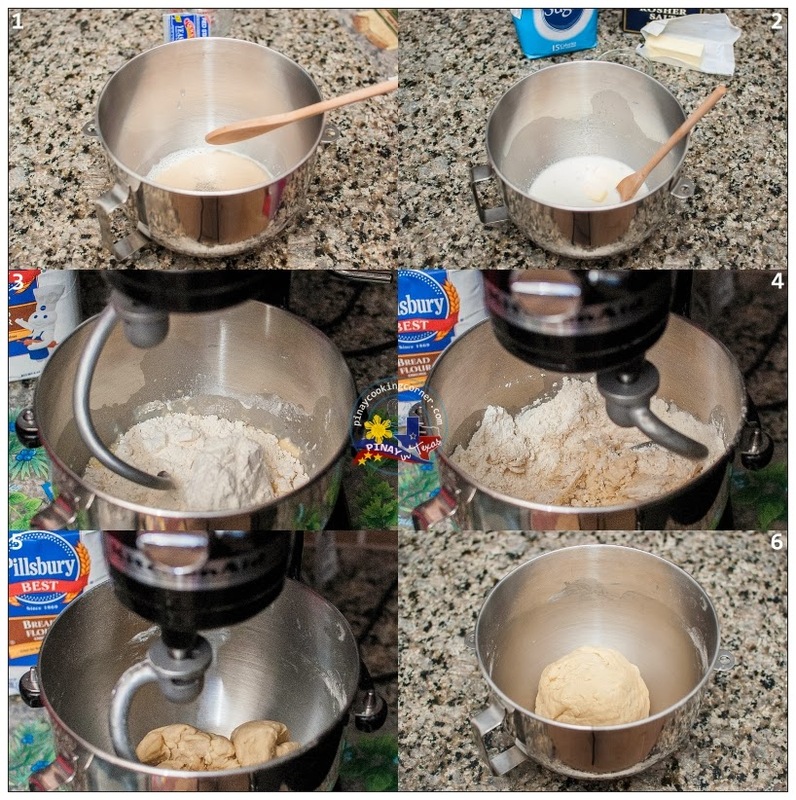 Fit mixer with dough hook, and with mixer set on low speed, slowly add in bread flour and mix until well blended. Continue kneading mixture on low speed until smooth and elastic, adding up to an additional 1/4 cup flour as needed. If you don't have an electric mixer, you can knead by hand. Transfer to a lightly buttered bowl, cover with plastic wrap and allow to rest in a warm place for 1 1/2 hours or until doubled in size (I like to let mine rest in the oven with the light on). 3. In a bowl, dissolve baking soda in 3 cups hot water. 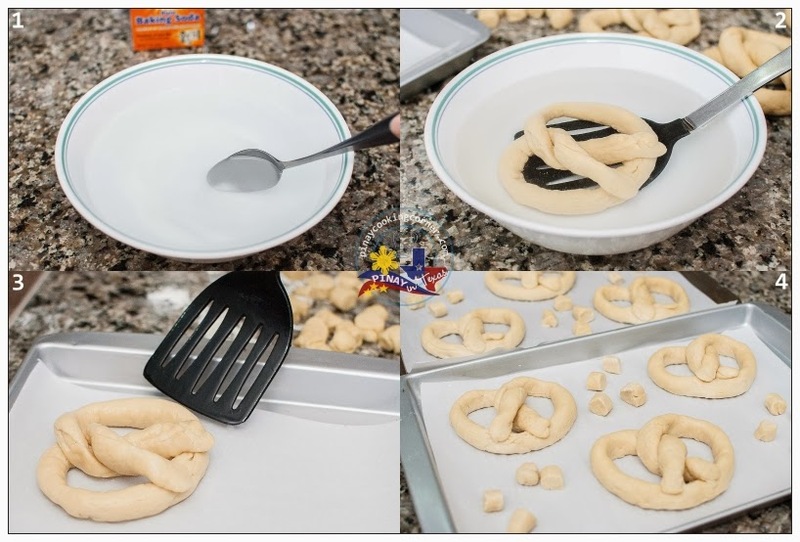 Using a slotted turner, gently dip each pretzel in the soda solution, then lift and allow excess water to drip off. Dipping the pretzels in soda solution will give the pretzels a nice, golden-brown color. Arrange on prepared baking sheet making sure to put them about 1 1/2 inches in between each other. Preheat your oven to 450 degrees and let your pretzels sit for 15-20 minutes before baking to allow for a second rise. Bake in preheated oven for 10 to 12 minutes or until golden. Remove from oven and using a slotted turner, dip into melted butter, toss to evenly coat then lift and shake off excess. Transfer to a plate and allow to rest 2 minutes to allow them time to absorb the butter. 4. Meanwhile, prepare the cream cheese dipping sauce. In a mixing bowl whip cream cheese and butter until smooth and fluffy using an electric mixer. Stir in powdered sugar and vanilla and mix until well combined. Add heavy cream and whip until fluffy, about 2 minutes longer. Store in refrigerator in an airtight container. 5. Finally, in a bowl, mix granulated sugar and cinnamon until well blended. 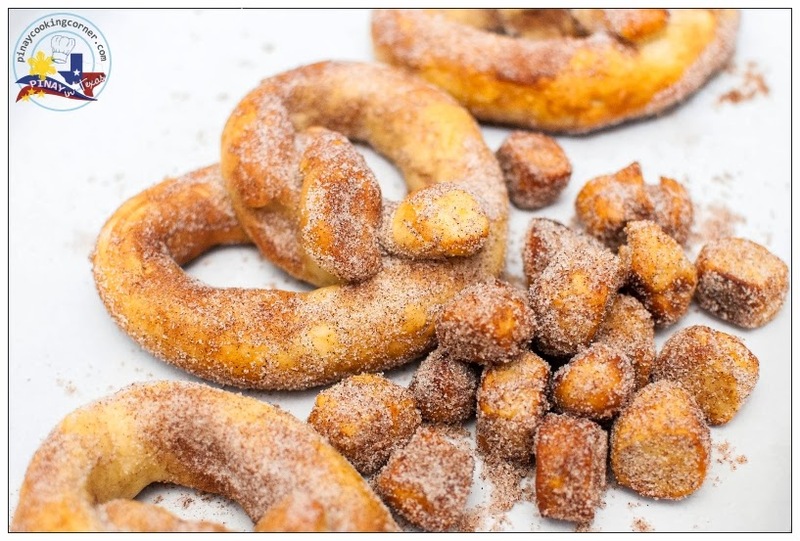 Dip butter coated pretzels into cinnamon sugar and toss to evenly coat. Serve warm by itself or with cream cheese dipping sauce (these are best served warm so I'd recommend rewarming them once they've cooled. To do so microwave on a plate for 10 - 20 seconds). pretzels! omigosh! i miss these! :) i'm going to give this a shot.thanks for the recipe. Ohh sus pretzels se ven muy ricos e irresistible me encantan,abrazos.